Whilst much of the original meaning may be lost to antiquity and what remains, compounded unfathomly by a myriad of interpretation of the faithful, there remains no doubt the importance the foot and shoe metaphor has played in the Holy Scriptures. Whether by chance or coincidence Christians would protect the feet by the patronage of the holy. 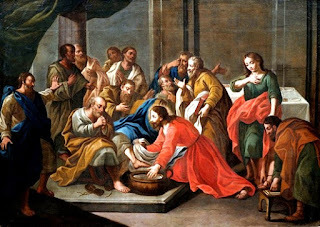 Two Saints champion the legs and feet, St Peter (The Apostle) -The Feast of Peter and Paul is June 29th; and Servatus (Servaas, Servatius or Servais). His memorial day is 13 May. Servatus is frequently depicted as a bishop with three wooden shoes. From early antiquity it would appear, metaphoric reference to feet was an important form of communication in both symbols and language. Despite this, to date, there has been an absence of academic scrutiny to explain this phenomenon. Through the centuries, a plethora of meaning has been attached to the simple metaphor, but which gave greater association to them in the New Testament as the means to the spread of the Gospels. This may, in part, reflect the transition from rural culture and custom of the Old Testament to urbanization and citizenship as reflected when the New Testament was written. Certainly Christians' evangelical need to travel on the path of righteousness would require healthy feet and necessitate the need to take care of them. This would entail protecting them both literally as well as metaphysically. Importance of feet and their association with commitment to faith remains in modern religions. Albeit, the origins for most of the faithful remain clouded. True meaning has probably been lost within translations and the plethora of interpretation made by the devout, yet despite this, feet metaphors remain popular within common English vernacular and can describe human behaviour from the cradle to the grave. The origins of which appear to have derived, or are at least have been reflected, within the Holy Scriptures. In the beginning was - the feet!